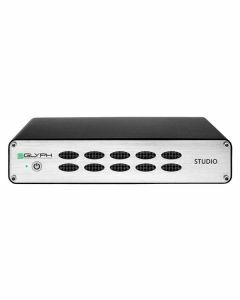 Glyph's Studio USB 3.0 external hard drive pushes industry-leading protection and performance to your rig. Exceptionally high data transfer speeds are provided by the innovative Studio USB 3.0 hard drive, making it well suited to high-track-count recording sessions, high-def sample playback, and HD video editing. Two further connection options are also supported in the form of FireWire 800 and eSATA ports; capitalising on the most modern technology without losing backwards compatibility. Thanks to impressively silent operational noise levels to its premium three year warranty, it’s easy to see why the Glyph Studio USB 3.0 hard drive is a favourite among professionals. The Studio drive from Glyph Technologies utilises a hard drive that spins at 7200 rpm and has 2TB of storage capacity for videos, images, music and any other file type. The Studio S2000 can connect to either Windows or Mac systems because of its USB 3.0, eSATA and FireWire 800 ports. Cables are included for each. Using any of these connections, users can expect data transfer rates up to 184 Mb/s. Glyph Technologies is additionally compatible with content creation products like AVID, Pro Tools, Logic and Adobe CC. Glyph Studio has been developed from the bottom up to deliver the highest performance speeds, critical reliability and an unassuming, sophisticated experience throughout the creative process.